At this point, nobody is surprised and find copies from China for Apple products (like GooPhone 5 , which already announced a while). This time have cloned the iPad mini and mini GooPad have called. The next video that I included is to promote it. Virtually identical on the outside but quite different inside. This tablet runs on the Android system, as is usual with copies of Apple, not iOS (although offers iOS theme). In addition, such copies usually leave much to be desired, though, so it seems, this time have improved the technicalities of the new product. 8 GB of internal memory. You do not have GPS or blueetooth. Android System 4.1 with iLaunch (with iOS theme). That's right: the price of this new copy is $ 99 (about 77 €) and, as rumored, will go on sale this November. What do you think of the new product GooPad? 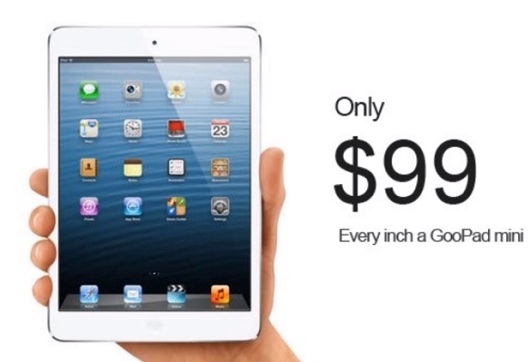 Do you prefer the real iPad Mini? Should I change the external design of iPad Mini? Now there is a new alternative of ipad mini which is 7.9 inch with bluetooth and more slim in the OrientDeal.